It’s estimated that more than 355,000 house fires occur every year in the U.S., causing a total of $6.5 billion in fire damage repairs. With the majority of these incidents occurring in cooking spaces, it’s clear that all households should place a priority on kitchen safety, especially when working with flammable resources. Here are five ways you and your family can keep dangerous flames out of the kitchen. While food may be appropriate, putting other substances inside your microwave can cause fires. Flammable materials that should be kept out of the microwave include paper, anything containing metal, Styrofoam™, and single-use plastic containers. Also, never turn on the microwave if there isn’t anything inside, as this may cause it to ignite. 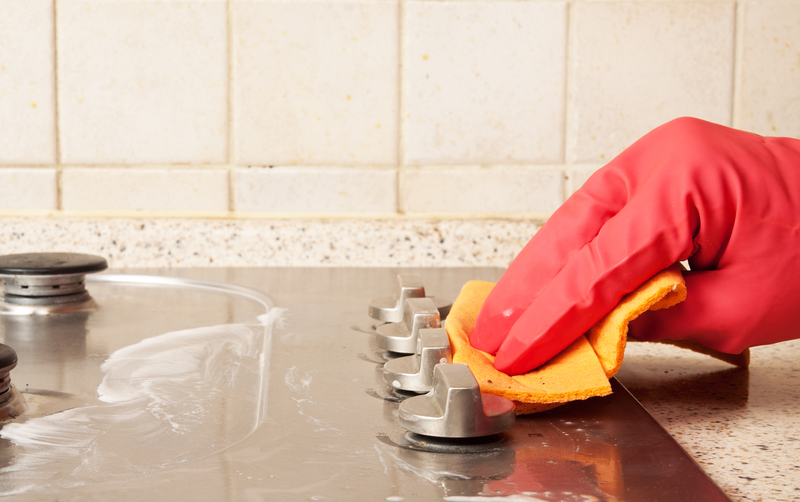 Keeping a clean kitchen can go a long way in preventing the need for fire damage repair. Specifically, it’s critical to keep grease and oil stains off your surfaces, as these substances are highly flammable. It’s also important to keep paper, dish rags, and oven mitts away from the stove. To prevent electrical fires, always keep plugged-in appliances away from water sources — such as the sink. Whenever you’re cooking, it’s essential to stay near the kitchen. Even if you leave the area for a quick second, your food can overheat and spark a flame — especially if you’re deep frying or cooking on the stove. If your food starts to burn while you’re cooking, remove the pan from the heat source and cover it with a lid. Water can actually worsen fires that are started by grease or electrical resources. Putting out electrical fires with water may also increase the chances of a shock. Instead, put out the flames by spraying them with a multipurpose fire extinguisher, smothering them with a pan lid or heavy cloth, or covering them with baking soda. Since kitchen appliances can produce excess heat and cause a fire if they’re left plugged in, you should unplug them whenever they aren’t in use. To avoid the need for fire damage repair, never use a cord that’s damaged or frayed, and don’t overload outlets. Additionally, don’t rely on extension cords — plug the appliance directly into the outlet. Following these steps can greatly reduce the risk of a kitchen fire, but if one occurs, you can turn to the trusted pros at SERVPRO of Greater St. Augustine / St. Augustine Beach. Equipped with state-of-the-art resources, this residential and commercial restoration provider can confidently provide fire damage repair and help return your home to its original condition. For more details on their water damage and fire restoration services, visit the emergency cleaning service online. To request help at any hour of any day, call the St. Augustine, FL, office at (904) 429-4457.